All technical information and scientific data released by US Government agencies (e.g., NASA, EPA…) are subject to sudden variation because of political expediency. This caution also extends to the fidelity of the information provided by UN organizations (e.g., FAO, WHO…). Part 3. Is a Future Possible? Part 5. Where Is All the Money? Point of No Return: Unless global energy consumption is reduced immediately to below 60EJ, mechanisms that are destroying ecosystems including ozone holes, global heating, extreme climate events... reach the point of no return, overwhelm the life support systems, render most cities uninhabitable by 2015 or earlier. Who is thinking, if we all think alike? – Freud’s theory of unconscious mind, unconscious desire and repression. Freud’s theory of unconscious mind, unconscious desire and repression forms the backdrop for a powerful myth that, coupled with a discourse based on [fatal] “traditions” [social proof] and religious dogma, are driving human race towards extinction. Cialdini cites the classic example of “bystander inaction” that has been the subject of much debate in political, scientific and journalistic circles. The case is about the murder of Catherine Genovese in Queens, New York City. The murderer, the NYC police revealed inadvertently, had stalked and attacked his victim for thirty five minutes in three separate attacks before finally stabbing her to death. At least thirty-eight of the victim’s neighbors witnessed the entire attack “from the safety of their apartment windows without so much as lifting a finger to call the police.” Why? Why did so many “good folks” fail to call the police even anonymously? Did those folks hated the victim and wanted to see her dead? Were they all cold-hearted bastards who were hardened by the sheer volumes of violent crime in NYC? Were they afraid of the murderer? Was it the “depersonalization” associated with urban life? What are we doing as the global catastrophe unfolds? 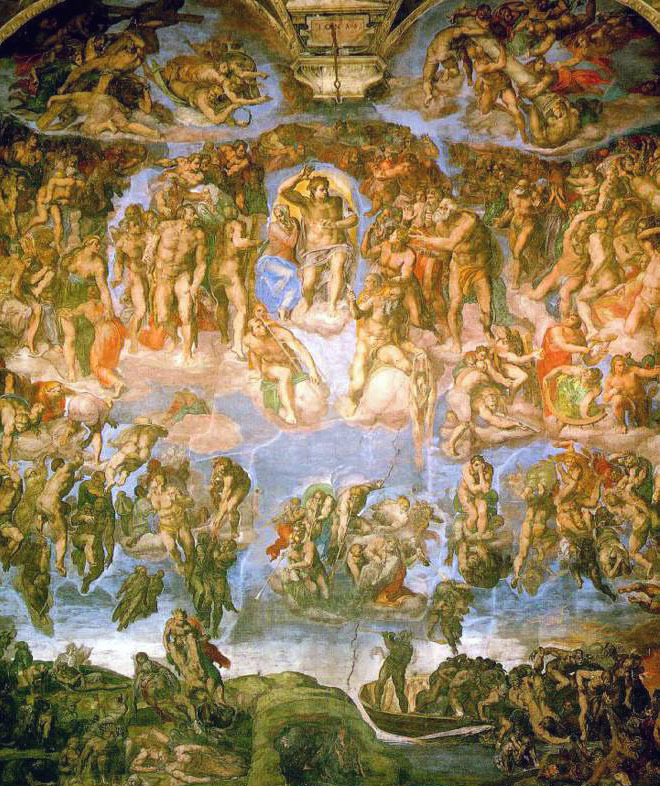 The Last Judgement – Fresco in the Sistine Chapel by Michelangelo. Where does the religious dogma come in? Among the examples cited are: The Montanists of Turkey (second century CE); the Anabaptist in Holland (16th century); The Sabbataists of Izmir (17th century) and the Millerites of the US (19th century). Posters like this were placed in public locations around the New England area in 1992. (Image maybe subject to copyright). See MSRB Fair Use Notice. So here we have it. The “almighty” took the good part of 4.54 billion years to create and perfect the Earth (not counting the preparatory time of 9 or so billion years that he previously spent to “create” the universe) so that it could be destroyed by a cataclysmic event, at least according to Christian eschatology (study of the religious beliefs concerning final events, or End Times). With the heaven and angels (“they were created before God created the Earth”) awaiting our arrival, do we need to clean, restore and preserve this garbage-dump of a planet and keep it fit for life? Why must we bother, if our peers, the pluralistic ignorant inactive bystanders, who surely know better because there are so many of them, invite us to have faith and join the believers instead? For those of us who believe, “whosoever shall call on the name of the Lord shall be saved …” latecomers may dial “R” for Rapture!